Dina C. Kaplan is an Attorney with more than thirty five years of litigation experience. She has been protecting the rights of children with disabilities for the past nineteen years. Her practice consists mainly of representing families at Individualized Education Program (IEP) meetings, Due Process Resolution Conferences, Mediations and Hearings involving Special Education issues. Ms. Kaplan also represents families in Fair Hearings with Regional Centers. 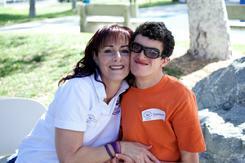 Dina Kaplan is the parent of Brandon, a twenty-two year old young man who has multiple physical and developmental disabilities. Her journey learning to advocate for Brandon, lead her to special education law and civil rights for children with disabilities. It also inspired her to establish The K.E.N. Project a non-profit organization that provides training, support, information and education for parents of children with special needs and professionals who work with children with special needs. Ms. Kaplan is also frequently asked to speak at various conferences and seminars regarding special education law and children's rights. Dina and her son Brandon.